Hi friends! Hope you are all in good spirits. Sikkim, the border state in North East India is a favorite of so many travelers. The capital Gangtok is the most famous and well known place in Sikkim and is always full of travelers from all over India as well as the world. It's natural beauty, picturesque locales and amazing lifestyle of local people make it a major attraction for all the travelers. However, there is more to Sikkim than Gangtok. Away from the hustle bustle of the city, holding it's own beauty and charm with some of the most interesting sites, lies another least known and explored amazing place named Pelling. Pelling is located at 131 km(82 mi) from state capital Gangtok and is situated at an altitude of 2150 m(7200 ft). It is 10 km(6.3 mi) from the district headquarter of Gyalshing. 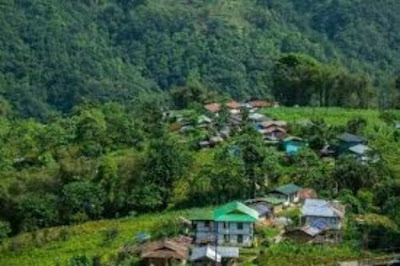 A small hill town, this place is still unspoiled and unaffected by human invasion and the land around Pelling is still virgin. The prime attraction in Pelling is that it offers an unparalleled view of the snow clad peaks of Kanchenjunga and you can easily see the complete Kanchenjunga range from here including peaks like Koktang, Kumbhkaran, Kabru, Pandim etc. You can get the best view of these peaks even from your hotel here. This is the closest you can get to Kanchenjunga range. Pelling also serves as a base for many treks. 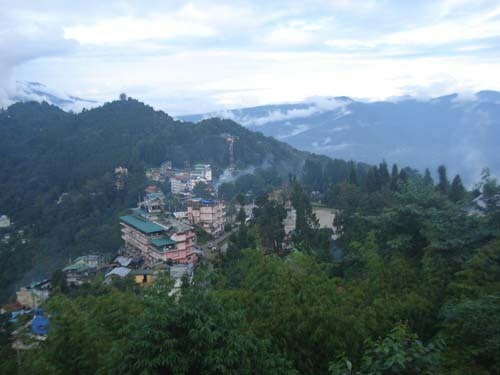 Also, it is a place which serves as the center point to visit many other amazing places of Sikkim. The land around Pelling is covered with alpine vegetation and so many waterfalls enhance the beauty of hillside. PEMAYANGTSE MONASTERY is one of the oldest and beautiful monasteries here. It was built in the year 1705 and is a three storied structure. The meaning of it's name is "perfect sublime lotus". The monastery has a great collection of paintings and sculpture and contains statues of saints and Rinpoches. It's third floor has a seven tiered model, made of wood and painted, of the abode of Guru Rimpoche. Every year, a dance called Cham is performed in the months of January and February, in Pemayangtse monastery. It is located hardly one km from Pelling. 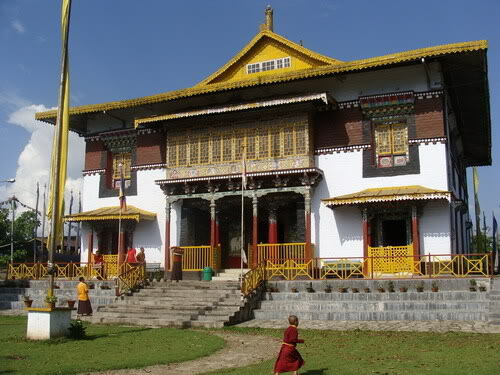 SANGA CHOLING MONASTERY is another landmark of Pelling. It is the oldest monastery, built in the year 1697 and is about 3 km(1.9 mi) from the town. The road is not motor able and you will have to walk up to the monastery. It takes around 40 minutes to walk from Pelling to Sanga Choling monastery. Once you reach there, you can have a magnificent view of Kanchenjunga as well as Pelling. RABDENTSE RUINS is another point of attraction. 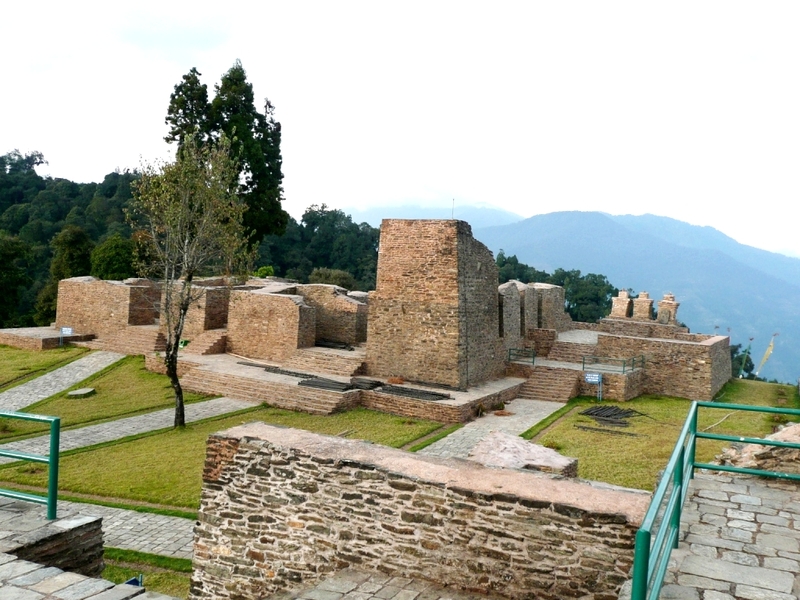 It used to be the capital of Sikkim kingdom and kings used to rule from this palace till around 1814. The only remains of the palace now are a few semi broken walls. It is located at 2.3 km(1.5 mi) from Pelling. From the entrance, you have to walk for 1 km through a woodland, passing by a large area where birds are kept. This is the most photogenic site in that it gives you very clear and amazing view of the valleys and hills around. It is a photographer's delight. RIMBI WATERFALLS are situated at 5 km(3.1 mi) from Drap on Khecheopalri route. 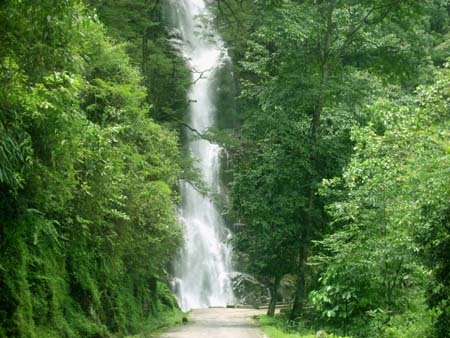 It is one of the most beautiful waterfalls in Sikkim and the oldest in West Sikkim. It was built in the 70s by the last king of Sikkim. A garden named Sewaro Rock Garden has been developed here which comprises pools, pathways, manicured gardens and of course rocks. It is a must see site around Pelling. 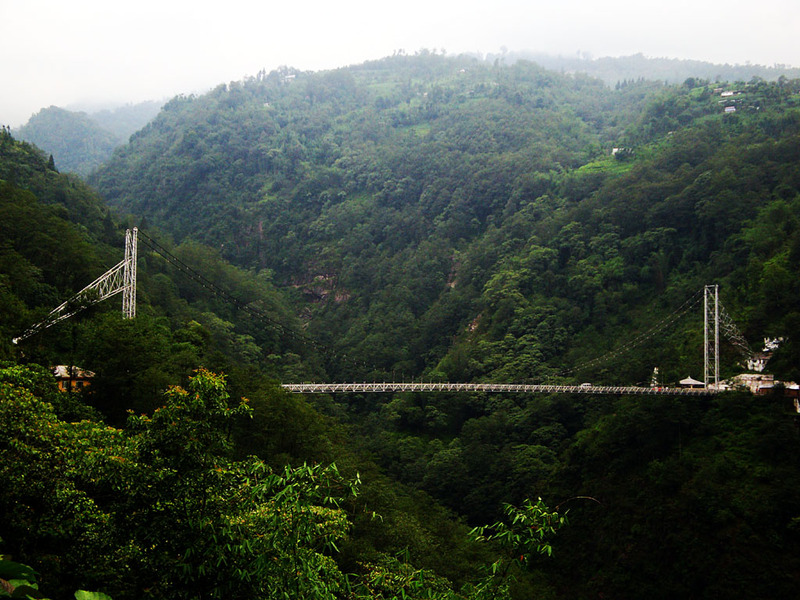 SINGHSHORE BRIDGE is located around 5 km(3.1 mi) from Pelling. 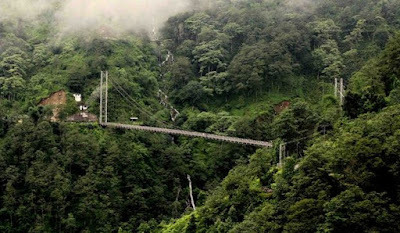 It is the highest bridge in Sikkim and second highest in Asia. It is a man made marvel to be admired. Standing in the middle of the bridge and looking at the greenery below, with wind blowing on your face is a great experience. With sound of water splashing in the river as well as waterfalls, it becomes an unforgettable experience. With a height of over 100 m, it will give you unbelievable thrill. DARAP VILLAGE is located 8 km(5 mi) away from Pelling. A small and quiet village, it holds breathtaking scenic beauty. Just stay in any of the beautiful homestays here to experience the village life. Nestled in the majestic Himalayan range, this village offers calm and natural retreat from the noisy city life. You can become a part of the local Limboo community during your stay here. Process cheese in old way or churn butter with them. Take a stroll on the river side in the cool climes. Or participate in the routine activities of the local villagers. Enjoy the homemade local cuisine. And soak in the beauty of nature lying around this picturesque village. A homestay in Darap village can cost anything between 500-3000 INR. There are many more beautiful places, including monasteries, waterfalls etc. to rejuvenate you. Also, there are many adventure activities also like trekking, Jungle walk, bird watching and biking that you can indulge in. AIR - The nearest airport is Bagdogra, which is around 135 km(85 mi) away and it takes about 4-5 hrs to reach Pelling from here. You can hire a taxi or bus from here. RAIL - The nearest railway station is Jalpaigudi, which is well connected to all the major cities of the country and is 140 km(88 mi) away. You can get buses as well as taxis from here to reach Pelling. 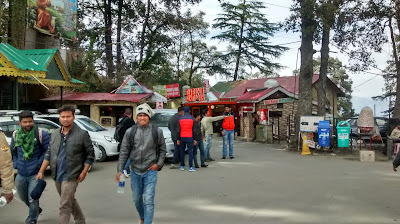 ROAD - Pelling is well connected to other cities of Sikkim by road. State run buses are available to travel from one place to another. Some private buses and taxis also ply between other cities of the state as well as other neighboring states. 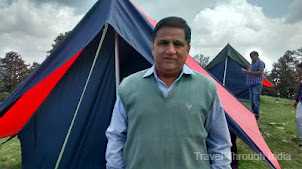 STAYING IN PELLING - There are many good hotels in Pelling where you can stay as per your budget. Apart from this, there are guest houses and resorts also which can cater to your taste and choice. Pelling is fast becoming a tourist attraction because of it's natural beauty and the fact that it offers the closest view to the world's third largest peak Mt. Kanchenjunga. You can visit this place at anytime of the year as the weather remains good throughout. Winters can become harsh but if you love snowfall, December and January are the months for you. It is a place for all kinds of travelers. So what are you waiting for? Grab your backpack and head straight to Pelling for an unforgettable experience.